You may have noticed that we were down for around 7 hours this week. It kind of caught us off guard as it was mostly during our own down time that it occurred. I certainly remember thumping the TV when it didn't work and that often fixed the problem but hadn't thought of trying it on a computer! We suspect it might be a motherboard issue so we're ordering a replacement. I will be starting on the 3 volume History of Glasgow in the next week or so. I will say this publication has footnotes from hell! There is hardly a page that doesn't have them and quite often there are 4 - 6 of them per page. Mind you for those that are interested in doing further research many of these footnotes give you the source of the information. Our visitor attraction this week is the award winning Highland Folk Museum situated on Kingussie Road, Newtonmore. The Highland Folk Museum triumphed at the 2007 Highlands and Islands Tourism Awards, bringing home to Newtonmore one of the top prizes – the Tourism People Development Award. The Folk Museum is situated within the boundaries of the Cairngorms National Park on two sites: one in Kingussie, and the one we are looking at this week at Newtonmore. 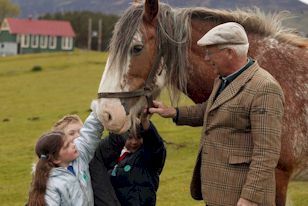 The outdoor museum at Newtonmore opened in 1995 and is a mile long living history site that includes reconstructed buildings, a 1700s Township, a 1930 working farm, live interpretation and a range of visitor facilities. The Highland Folk Museum promises ‘to ensure that all visitors have a memorable quality experience, within a safe and cared for environment’, and that is exactly what they achieve. A great day out for all the family as the Museum succeeds in its aim of preserving and recording aspects of Highland life from the 1700s onwards. Within sight of the Cairngorms this interesting and varied landscape combines farmland, woodland and open area. The Highland Folk Museum was the brainchild of Dr Isobel F Grant, who although born in Edinburgh and raised in London, always had the traditional home of her family in the Highlands in her heart. In 1934 she determined to have an open air Highland museum and in 1944 a museum was opened in Kingussie – the forerunner to the 1995 Newtonmore development. Dr Grant’s vision comes alive at Newtonmore as the Highland township which is based on the original larger Badenoch settlement of Easter Raitts takes you back to the era of the Jacobite Risings and the days when Cluny MacPherson brought his clan out on the side of the deposed Stewarts. Aultlarie Farm, probably dating from the early 1800s, is worked as it operated in the 1930s. A reminder of how farming was in the early days of the 20th century. The Open Air Museum Buildings range from The Railway Halt, Glenlivet Post Office (from 1913), a shepherd’s bothy and fank through to the Leanach Kirk, an early 1900s corrugated tin church relocated from Culloden and Fraser’s Joiner’s Workshop where carts could be repaired and coffins supplied! As you would expect the site includes audio visual introduction for visitors, café facilities, toilets, bairn’s play area, shop and picnic area. 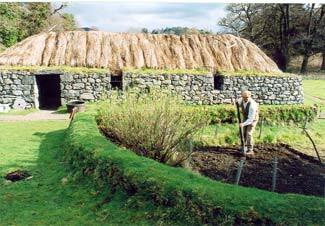 Visit http://www.highlandfolk.com for further details of this magnificent tourist and historic attraction. Whisky and milk would have been in plentiful supply in 1700s Highland Townships and this week's recipe - Scotch Paradise - contains both. Method: Moisten the edge of a highball glass with sugar syrup. Roll the glass in desiccated coconut to coat the outer edge. Fill a cocktail shaker with ice and add – a large (50ml) measure of Whisky, a dash of coconut syrup and top up with milk (enough to fill the glass). Shake well and pour into the glass. We are onto the R's now with Queensberry, Rae, Raeburn, Rait, Ralston, Ramsay, Randolph, Rattray and Reay. RAMSAY, a surname derived from Ramsey or Ramsea, the island of rams. Lower, in his ‘Essays on English Surnames,’ says that the abbot of Ramsay bore on his seal a ram in the sea. Simundus de Ramsay, the ancestor of the Dalhousie family, the first of the name in Scotland, came from the county of Huntingdon, in England, where the name of Ramsay is a local appellation, and received a grant of lands in Mid Lothian from David I. (see DALHOUSIE). We learn from Douglas (Peerage, Wood’s edit. Vol. i. p. 401,) that he was a witness in a charter of Archbishop Thurston to the monks of Holyrood in 1140, and also in one, in the reign of Malcolm IV., wherein William de Morville, constable of Scotland, granted the lands of Gilmerton, near Edinburgh, to Eudulph, the son of Uchtred. William de Ramsay is witness to a charter to the church of Coldingham, in the reign of King William the Lion, before 1198. Patrick de Ramsay is witness to a charter of King Alexander II., to the abbacy of Dunfermline in 1227. Another William de Ramsay was of the council of King Alexander III. in 1255, in the minority of that monarch. He witnessed a charter of Duncan de Lascels in 1260, also a donation of Symon de Kyner or Kinneir, to the monks of Balmorine, in Fife, 1st September 1261, and another, signed in presence of King Alexander III., in the castle of Edinburgh, in May 1278. He is said to have had three sons; William, his successor; Malcolm, witness to a charter of William de Valloniis in 1284; and John, witness to the same and to another charter in 1278. William de Ramsay, the eldest son, swore fealty to Edward I. of England, for his lands of Dalwolsie or Dalhousie, in the county of Edinburgh, and of Foulden, Berwickshire, in 1296, and again in 1304. He joined King Robert the Brus, and was one of the patriot barons who signed the letter to the pope, asserting the independence of Scotland, 6th April 1320. Sir Alexander de Ramsay of Dalhousie, supposed to be his son (referred to in the article DALHOUSIE, earl and marquis of), distinguished himself by his valour and daring in the reign of David II., and was one of the most conspicuous of the Scottish leaders against the English at that period. In August 1335, when Edward III. invaded Scotland, and a considerable body of foreign troops, under the command of Guy count of Namur, had landed to his assistance, the latter were encountered and defeated on the Boroughmuir of Edinburgh by the regent Randolph, earl of Moray, the earl of March, and Sir Alexander Ramsay. Collecting together a band of adventurous young men, the latter took shelter in the caves of Hawthornden near Roslin, and in the adjacent caves of Gorton, and continually harassed the English by his sallies against them. He relieved the castle of Dunbar, when besieged by the earl of Salisbury in 1338. He even extended his inroads across the border, and, on one occasion, returning from Northumberland with much booty, he was encountered by Robert Manners near Wark castle. Pretending to fly, he led the party into an ambuscade, when he attacked and totally defeated them, making their leader prisoner. He took the strong fortress of Roxburgh by storm from the English, 20th March 1342. As William Douglas, the knight of Liddesdale had previously failed in an attempt on the same fortress, David II. conferred his office of sheriff of Teviotdale on Ramsay. This roused the resentment of Douglas, formerly his friend and companion in arms, and while Ramsay was holding a court in the church of Hawick, 20th June 1342, he came with an armed retinue, and dragging him from the judgment-seat, conveyed him to his castle of Hermitage, where he shut him up in a dungeon, and left him to perish of hunger. It is related that above the place of his confinement there was a granary, and that with some grains of corn which dropped down through the crevices of the roof, Ramsay protracted a miserable existence for seventeen days. You will need to go down the pages a bit to find the links to the books. The Parish of Cruden: Extent.— The length of the parish from the east, where it meets the parish of Peterhead, to the west, where it meets the parish of Ellon near the House of Dudwick, is about 11 miles. The breadth at the west end is about 7 miles, at the east end about 4 miles. The sea is the boundary along the south side: the parishes of Slains, Logie Buchan, and Ellon, along the west; Old Deer and Longside along the north; and Peterhead along the east. The sea-coast from the east end to Slains Castle is bounded by high and formidable rocks of red granite. Close by Slains Castle is the Ward of Cruden, a small fishing village, where vessels can occasionally bring coal and lime. From this place to Land End, a distance of about two miles, is the Bay of Cruden, a fine sandy beach, at the south end of which a range of sunken rocks runs far into the sea, called the Scares of Cruden. The rocks from this place, all along the south, are black basalts, and very formidable. The Parish of Kildrummy: Boundaries.—The parish is bounded on the north, by Achen-doir; on the south, by Towie and Leochel Cushnie; on the, east, by Tullynessle and Alford; on the west, by Towie and Strathdon. And this now completes this book. "May 9, 1701. This day Mr. Alexander Gordon, who was minister of Inveraray, and the only living member of the Assembly 1651 told me, that the Marquise of Argyle was very piouse; he rose at 5, and was still in privat till 8. That besides family worship and privat prayer, morning and evening, he still prayed with his lady, morning and evening, his gentleman and her gentlewoman being present. That he never went abroad, though but one night, but he took his write-book, standish, and the English New Bible, and Newman's Concordance, with him. "November 11. That after King Charles' Coronation, when he was in Stirling, the Marquise waited long for ane opportunity to deal freely with the King anent his going contrary to the Covenant, and favouring of Malignants, and other sins; and Sabbath night after supper, he went in with him to his closet, and ther used a great deal of freedom with him; and the King was seemingly sensible; and they came that length as to pray and mourn together till two or three in the morning, and when at time he came home to his lady she was surprised, and told him she never knew him so untimeouse; he said he had never such a sweet night in the world, and told her all, what liberty they had in prayer, and how much convinced the King was. She said plainly they were crocodile tears, and that night would cost him his head, which came to pass; for after his restoration, he resented it to some, though outward, he still termed the Marquise father, and caused his son to write for him up to court, which he did again, but the Marquise would not come; till at last the Earl wrote partly in threatening, and partly with the strongest assurances, which prevailed, and he was no sooner come to his lodgings in ane Inn in London, but he was there seized and carried to the tower, and I think never saw the King, for all his insinuating hypocrisy and fervent invitations. "The day on which the Marquise of Argyle was execute, he was taken up some two hours or thereby in the forenoon in civil business, clearing and adjusting some accounts, and subscribing papers, there being a number of persons of quality in the room with him, and while he was thus employed, there came such a heavenly gale from the Spirit of God upon his soul, that he could not abstain from tearing, but least it should be discovered, he turned unto the fire, and took the tongues in his hand, making a fashion of stirring up the fire in the chimney, but then he was not able to contain himself, and turning about and melting down in tears, he burst out in these words, 'I see this will not doe, I must now declaire what the Lord has done for my soul ; he has just now at this very instant of time, sealed my chartour in these words, Son, be of good cheer, thy sins are forgiven thee;' and indeed it seems it was sealed with another remarkable witness, for at that very instant of time, Mr. John Carstairs was wrestling with God in prayer in his behalf in a chamber in the Canongate with his lady, the Marchioness of Argyle, pleading that the Lord would now seal his Charter, by saying unto him, 'Son, be of good cheer, thy sins be forgiven thee.' The Marquise hints at this in his speech. (I had this from my father J. C. Carstairs). "The Marquise was naturally of a fearful temper, and recconed he wanted naturall courage, and he prayed most for it, and was answered. When he went to his execution he said, 'I would dye as a Roman, but I chuso to dye as a Christian.' When be went out, he cocked his hatt, and said, 'come away, Sirs, he that goes first goes cleanly off.' Ther was one of his friends in the prison with him, and after some silence, the gentleman broke out in tears. 'What's the matter,' said the Marquise, 'I am in pain,' says he, `for your family, my Lord.' 'No fear,' said the Marquise, 'it's none of thir things will ruin my family.' 'I fear their greatness,' says he, `will ruin them.' I wish this prophecy be not too evidently fulfilled in his posterity." The three estates—Rising importance of the burgher class—Dwelling-house of a sixteenth-century cloth merchant—The hall—Armour—The bedchamber—Agricultural implements—The booth—"Ane hingand brod of oley cullouris"—Early interest in painting in Scotland—Pictures and painted cloths—The burgesses as art patrons and introducers of foreign products and ideas—The "keiking glass"—The alarm clock—Some items in the inventory of Sir David Lyndsay of the Mount—Wood-carving in Scotland—Domestic panelling—Linenfold and other patterns—Carved wood from Montrose—At Ethie Castle—From Threave Castle—Cardinal Beaton's panels at Balfour House—Embroidery in early times—Its development in the sixteenth century —Queen Mary's embroideries—"Story work"—Various examples—The Rehoboam set—The Earl of Morton's sot—Probable date and origin. The Covenanting Period—Ascetic views of life—A Covenanter's courtship, with an eighteenth-century contrast—Conditions unfavourable to the development of furniture—New Scottish industries—Furniture and fashions from London—A Scottish nobleman's house—"The laiche hall" —The dining-room and silver plate—The drawing-room—New ideas in furniture and ornaments —The lettermeitt house—Bedrooms—Development of beds in Scotland—The knop sek—The strek bed—The letacamp bed—Kaissit beds—The box-bed or buistie—The "laych-rynnand" or truckle bed—The laird's mistake—The fourposter—Royal beds—Devices on the Queen of Scots' bed—Mourning beds and mourning customs—Queen Mary's bed-curtains from Loch Leven—Heraldic decoration of beds—Changing fashions in colours and colour names. The restoration of the Monarchy---Irreconcilable differences—Organised and harmonious national life impossible—Persecutions—The Acts of Indulgence----Inducements to accept the established regime—History of the times reflected in furniture—Severe and utilitarian character of Commonwealth furniture—Restoration chairs and day-beds—Chairs as evidences of changes in the treatment of floors—Easy chairs—Extravagance of the Court—Exotic materials--Cabinets—The chest of drawers—Tea, coffee and cocoa—Walnut tables—The virginalls—Barred grates—Forks not yet in use—Scottish diarists—Social life of the time—Billiards—Horse racing—The kirk stool—Going to church—Giving out the line—The hourglass—Periwigs, powder and Sedan chairs, as preluding the eighteenth century—Conclusion. It is Mr Everard who thus describes Tom, and in "Some Celebrated Golfers," in the Badminton Golf, the same writer says of Allan: "Apart from his excellent play he is described as a charming partner and an equally generous opponent; no amount of 'cross accidents' could disturb his equable temper, and when steering an indifferent partner with consummate skill through the varying fortunes of the game, no irritable word or gesture was ever known to escape him, however valueless, not to say destructive, the endeavours of his protege happened to be." In the same chapter Mr Everard tells us that Tom "curiously enough began to drive with his left hand below his right, a mode of play adopted by only two players in the writer's experience." He adds: "It was by a mere accident that Tom became a golfer at all, for his career was marked out for him, and arrangements all but completed, under which he was to have been apprenticed to a carpenter; but a casual question of old Sandy Herd as to why he did not get apprenticed to Allan Robertson as a club-maker, put the idea into his head. Allan considered the matter, the upshot of which was that he agreed to take Tom, who served under him four years as apprentice, and live as journeyman, and from that period began his golfing life. Possessing naturally a keen, good eye, he began before long to play a game which year by year developed, until in measuring himself against Allan Robertson, the latter found himself obliged gradually to decrease the odds of a half to a third, then to four strokes, until at last, if the 'old man' was not exactly 'beaten by the boy,' still the boy, or rather lad of twenty-two or thereabouts, rendered such an exceedingly good account of himself that the odds he was allowed were represented by zero. Here, then, was a fact. He could play the greatest living masters of the game and hold his own; but their interests were not divided, and it was rather as partners that they took the golfing world by storm." Few parishes in the Lowlands of Scotland afford scantier materials for the pen of the historian than that of Penicuik. Situated so near to the metropolis of Scotland, it might naturally be expected that it would have been the scene of many stirring events in Scottish story; but such records are sought for in vain. It lay away from the usual paths of invading armies, and it possessed no rich churches or monasteries to tempt the sacrilegious towards it for plunder. In old times the feudal aristocracy were not, with one exception, men who made any mark in the history of their country, and the place of their abode is undistinguished in son; or story. But while there have been no bloody battles lost or won within its borders, or deeds of heroism done by any of her sons to chronicle, these pages will, I trust, prove that there is much in the history of Penicuik parish, civil and ecclesiastical, that will be of abiding interest to those who can claim it as their birthplace or their home. To many scattered over the world the memory of our village, its river, and the overshadowing hills, must be sweet as an old song. If amidst the palm groves, or the prairies, or the busy marts of other lands, the perusal of these brief annals afford to any an hour or two of pleasant reflection, and strengthen their attachment to the old home from which they first started upon `Life's long race,' the author will be satisfied ; for his purpose in writing this book will, to a large extent, have been gained. The matter contained in these Annals has been taken from many sources. The following list contains the names of only a few of the authorities consulted :—Register of the Great Seal, Calendar of Documents relating to Scotland, Pitcairn's Criminal Trials, Register of the Privy Council, Exchequer Rolls, Acts of Parliaments of Scotland, Woodrow, Statistical Accounts of Scotland, Reports of the Society of Antiquaries, Rotuli Scotiae, Chalmers's Caledonia, various publications of the Bannatyne, Abbotsford, and Spalding Clubs, Origines Parochiales (Innes), Forsyth's Beauties of Scotland, Foedera, Dalkeith Presbytery Records, Penicuik Parish Session Records, etc. etc. I have been much indebted to local friends for freely communicating to me their recollections of past times. I should be ungrateful if I did not also acknowledge the kindness and courtesy of Dr. Dickson of the Register House; James T. Clark, Esq., of the Advocates Library; and J. M. Gray, Esq., Curator of the Scottish National Portrait Gallery. I would not be unmindful of the willing assistance I ever received in the Edinburgh Subscription Library from its esteemed librarian, Mr. George M'Whea; and, above all, do I tender my best thanks to the Rev. Alexander Thomson Grant of the Parsonage, Leven, for many valuable contributions from his stores of historical and antiquarian lore, sent me at a time when I did not myself know the sources from which trustworthy information could be obtained. A WORD of preliminary explanation of the object and scope of this book may not be superfluous, the more so that it takes a line which I am not aware has been taken in any previously published work. I have sought to outline the history of such branches of Scotch industry as merit notice by their extent or other peculiarity, to track out their modest beginnings, and to follow their subsequent development. This is what Bacon called mechanical history, or the history of industrial arts ; and I venture to say that the history of Scotch industry is peculiarly rich in that profitable knowledge which Bacon held to belong to such investigations. The main object of the book, however, is to describe the actual state of the chief branches of industry in Scotland ; and I thought I should best accomplish this by restricting myself to a plain nar­rative of judiciously chosen facts. The reader must expect to meet with few general reflections: it is hoped that many of these will be suggested without prompting on the part of the author. Another consideration has been kept in view. Since the Paris Exhibition, which revealed the surprising progress made of late years by our foreign competitors in the industrial arts, there has been much lively discussion on technical education. The discussion would be much more profitable were the disputants more correctly informed of the actual state of, and progress recently made in, the industries of Great Britain. It is proper to mention that the substance of the following pages originally appeared in a series of articles printed during last year in the weekly issue of the Scotsman newspaper. The articles were most favourably received as fair and accurate accounts of the branches of trade to which they related, and it is in accordance with a generally expressed desire that they are now reprinted in a more permanent form. The text has been subjected to careful revision; numerous additions have been made; and where it was considered essential, the latest statistics have been given. Early History of Coal—Objections to its being used as Fuel—First attempts at Coal Mining—Slavery in the Mines—The Scotch Coal Fields—Visit to a Colliery—Descent into a Pit—The Miners at work— Perils of the Pits—Social Condition of the Miners—Their Earnings, Strikes, and Unions—The Houses in which they Live—The Means provided for Educating their Children. Origin and Progress of the Manufacture of Iron in Scotland—Statistics of the Trade—Effects of over-Speculation—Coatbridge and its Furnaces—Description of the Gartsherrie Ironworks—The Smelting Process —Invention of the Hot Blast, and its effect on the Trade. Got this article in just as I was finishing up and thanks to Wally Turnbull, President, Turnbull Clan Association, for sending it in. As I write this, tomorrow is my birthday. Tom laughing mysteriously and even giggling sometimes, bless his sweet heart. I’m just caught up in wonder at the number of candles that will have to go on my birthday cake. It was just recently that I thought about getting older. I never even thought about age or mortality or that one day I would be an adult! My heart attack of five or six years ago brought up short. Today there is not a sign that I ever such. My new stress-free (Well, as much as can be stress-free.) life is mighty good for me. My hip surgery made me think too. I don’t know as I have learned all that much all of this time. ¨I’ve learned that you don’t make long-term plans. ¨I’ve learned that things you thought were sure” most times aren’t. ¨I’ve learned that sometimes people who are supposed to be your friends - aren’t. ¨I’ve learned that not everyone tells the truth. ¨I’ve learned it’s possible for people you trust to betray you. ¨I’ve learned that life is not fair. ¨I’ve learned that you will live through things so awful you think you will die. ¨I’ve learned that life has a way of evening things up. ¨I’ve learned to put myself in the hands of a higher power - and to trust that power. ¨I’ve learned that if you wait long enough, what you thought was really bad only opened doors good things. ¨I’ve learned that it’s never too late to find love and happiness, kindness and compassion and joy. ¨I’ve learned that money doesn’t really matter. ¨I’ve learned that true friends are the greatest wealth. If you know me, you know that I’m pretty much straightforward. When I love you, I love you and when I don’t, you probably know it. I don’t lie and I don’t cheat - thanks to my beloved grandmother who taught me that your good name is about all you really have. “Work hard and do your best and you’ll always be all right,” my grannie said. I’ve always tried to do those things. I hate to think what would have happened if she had been alive for the things that happened in my life recently - in one case for three decades and more - although nobody knew - and in another case, something that was an ambush. professed to love me were worse. My grandmother would have cleaned house, I’m afraid. It was a hard, hard time. I wasn’t sure I would make it. I survived and found a wonderful new life. The happy things continue. We’re about to embark on an almost unbelievable new and joyous journey in our lives. I’ll tell you about it sometimes soon.